Every day it seems there is a new Alexa story in the news, as for the moment the Amazon voice assistant is in the ascendant over its rivals from Google, Apple, and Microsoft. Today’s slice of Alexa weirdness comes courtesy of a newsreader in San Diego, who inadvertently triggered Alexa-enabled devices within hearing distance of a television to buy doll houses when he reported on a Dallas child’s accidental purchase. It’s unclear whether any doll houses were dispatched or whether the Echos and Dots merely started the process and asked their owners for confirmation, but we hope it serves to draw attention to the risks associated with an always-on and always-listening device. We’ve looked at how the technology has seemingly circumvented the normal privacy concerns of our own community, so it’s hardly surprising that this kind of incident catches the greater public completely unprepared. It’s one thing for the denizens of a hackspace to troll the owner of a Dot by adding embarrassing products to their wish list, but against a less-informed user who hasn’t worked out how to lock down the device’s purchasing abilities, it’s not too far-fetched to imagine a criminal attack. Voice assistants are clearly going to become a ubiquitous feature of our lives, and it is inevitable that there will be more such unfortunate incidents which will serve to educate the public about their privacy before the technology reaches maturity. This particular story is definitely Not A Hack, though as our “Alexa” tag shows the devices have huge potential to bring a new dimension to our work. 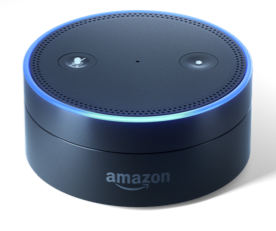 It’s up to all of us in our community to ensure that the voice assistant owners in our lives are adequately educated about them, and maybe resist the urge to say “Alexa, add all the Hackaday merchandise to my wish list!”.